I’m back in Normandy with the Bell family who came here from the UK in 2008 with their two children, to live the rural French life . The lush emerald countryside is being periodically soaked by waves of heavy showers which are probably the tail end of hurricane Irma, breaking up way across the ocean. Normandy is a very picturesque part of France and here in Percy we are in the department of Normandy known as the Manche (sleeve) and this area is home to, among other things, the Bayeux Tapestry, the Mont St Michel and Normandy cider. If you have been watching Vikings on the History channel (I am a big fan) you will know that the Vikings raided this area and took power in Northern France. The fiefdom of Normandy was created by the Norwegian Viking leader Hrólfr Ragnvaldsson or Rollo who gained power here and the name Normandy reflects Rollo’s ‘Norseman’ origins. The descendants of Rollo and his followers adopted the local Gallo Romance Launguage and intermarried with the area’s original inhabitants. They became theNormans– a Norman-speaking mixture of Norse and indigenous Franks and Celts. The fields here are full of beautiful brown spotted cows wearing what look like chocolate coloured spectacles. Known as the Normande these cattle originated in Normandy in the early nineteenth century. as a result of cross breeding of local dairy breeds with English shorthorn cows. These attractive beasts with their little horns and tufted fringes produce rich milk which makes delicious Normandy butter and cream. During World War II although much damage was done to the town of Coutances, the cathedral escaped largely unscathed. The towering structure dominates the town and can be seen from as far away as the island of Jersey. It is a classic example of the Gothic style of Normandy in its use of long, straight, vertical lines. Its interior is impressive, in particular the stunning stained glass windows which cast coloured light patterns onto the stone floor when the inconstant sun decided to show up now and again. I do enjoy a nice flying buttress. We wandered about the town centre, occasionally diving for cover as the heavy bursts of rain turned themselves on and off like a malfunctioning giant shower head. 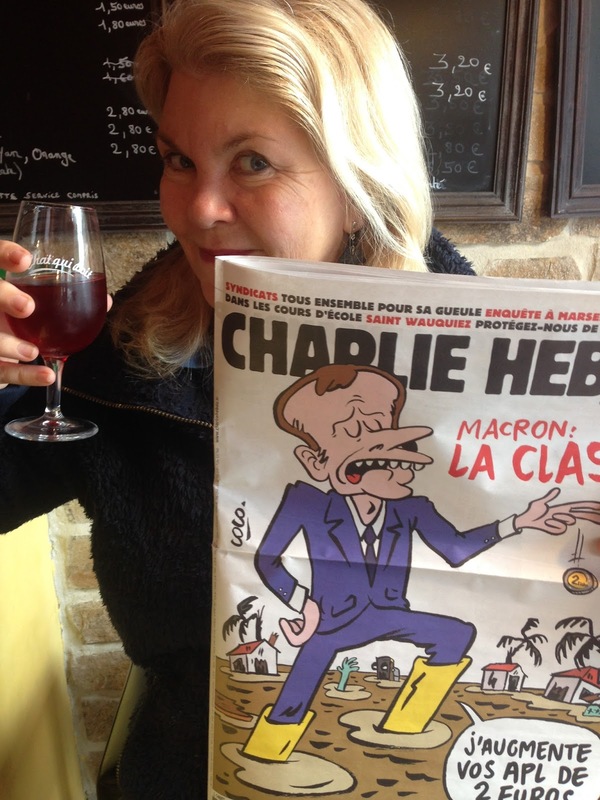 We popped into the ‘Chat qui Boit’ – ‘the Cat Who Drinks’ – a typical French bar with a wide selection of wine, an old record player with a pile of vinyl next to it and a Charlie Hebdo magazine on the counter featuring a cartoon version of Macron on the front page. All very French. As I sipped my Kir with Cassis, if I’d had a Galoise I would have probably lit it up, even though I don’t smoke. Back at home in the French kitchen Trouvé the cat ( so called because he was found on a haystack in the barn) was looking for some milk, and dinner for us humans involved much wine, many cheeses and fresh bread as well as whatever was the Plat Du Jour. Eating is still big en France!